Although this posting is nominally about banana bread, in a larger sense it’s also about cravings, since that’s the category for me in which this particular item falls. Of course, we all have certain foods we find ourselves yearning for from time-to-time, it’s just that some of us (arrow pointed to self here) seem to have more cravings than others—a list that includes everything from deviled eggs, to spaghetti and meatballs, to really sour pickles. Each of those foods are ones that on occasion have temporarily taken over my life, hijacking a meal or activity in the interest of satisfying some powerful hankering, though currently none seems to exert the pull that banana bread does for me, . 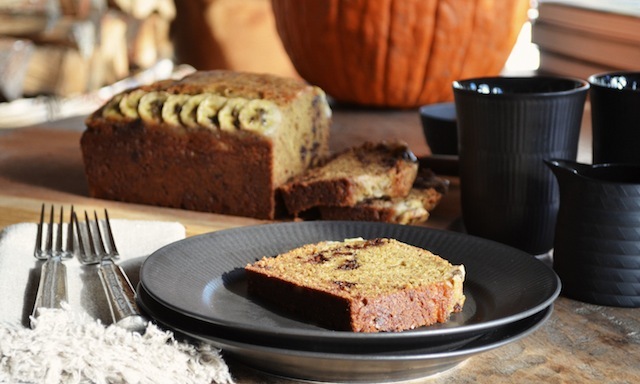 . . and not just any banana bread—banana bread with the added element of chocolate chips. Now in general I’m not much focused on the cake/bread confluence in which banana bread resides (though a gingerbread sighting does tend to make me slow down), but all that changes when I find myself in the presence of a baked good featuring anything banana and chocolate. It’s something that occurs with less frequency then you might expect—a good thing for my waistline perhaps, but one that tends to make me that much more susceptible when I do come across the combo. Still, either out of a lack of imagination or a sense of dietary self-preservation, trying my hand at this favorite item never really occurred to me. That is until a friend came to dinner a while back bearing a loaf of banana bread he’d made at home earlier that day. It was a perfect specimen of the confection, all golden brown and seductively shingled with caramelized banana slices. And though there weren’t any chocolate morsels embedded in its moist interior, what it did have was the unmistakable taste of real banana (not to be confused with the artificial variety found in mass-produced banana flavored baked goods). Even without the chocolate, the bread was compulsively eatable—sweet without being cloying, moist without being soggy, dense without being heavy. In short, it was the consummate banana bread. 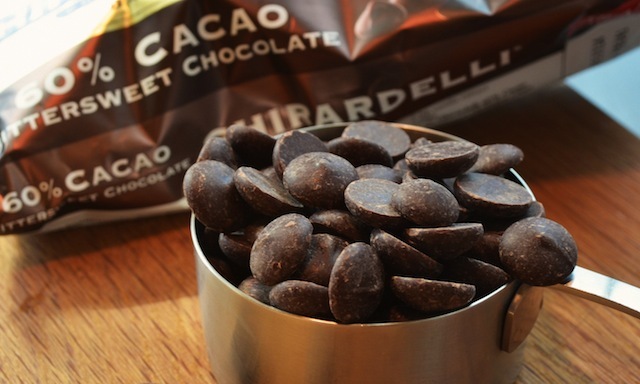 And as for those chocolate chips, that would be easy enough to introduce once I got my hands on the recipe. So a few weeks later, with the recipe in my possession (I should have known; it came from that ever reliable resource, America’s Test Kitchen) I assembled the various ingredients and set about making my own version of the bread. And, as is typical with any ATK recipe, I learned a few things along the way: namely, that a very ripe banana (i.e. a heavily speckled or even black one) contains more fructose than the un-ripened variety, which is starchier. In other words, when baking with bananas, ripe equals moist and sweet, while the opposite will deliver something dry and flavorless. Since the goal here is to create something that’s packed with flavor and moisture, you obviously want to use the most heavily speckled fruit you can get your hands on (and if the yellow variety is all you have on-hand, see my tip below for speeding up the ripening process). But since ripe can also mean a soggy final product, the recipe suggests an additional step—namely placing 5 of the recipe’s 6 peeled bananas in a heat proof bowl, covering them with plastic wrap (a few openings made with a sharp knife will allow the steam to escape), and giving the whole thing a 5-minute spin on high power in the microwave. Once the 5 minutes are up, peel away the cellophane and what you’ll find is perfectly softened banana that’s begun to release some of its liquid. 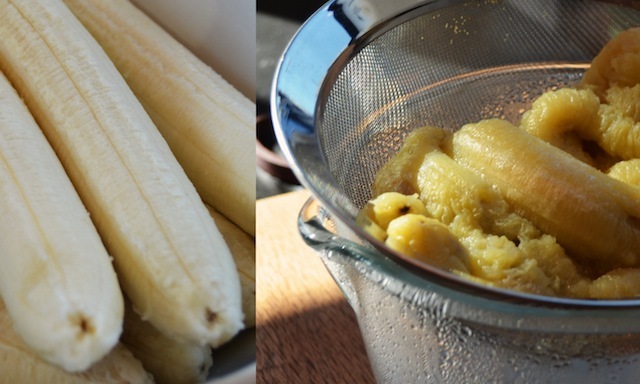 To continue this critical process, transfer the banana to a fine mesh strainer, place it over the same bowl in which you zapped the fruit, and allow the warm banana to drain for another 15 minutes or so, giving it an occasional stir to encourage the release of whatever moisture remains. At the appointed time you should have between a ½ and ¾ cup of juice—in other words, the element that risks making your bread soggy will have been successfully separated from the pulp that delivers the bread’s signature dense crumb and banana flavor. Of course, that juice has lots of flavor too, so rather than just pouring it down the drain, the recipe suggests reducing it over medium-high heat for five minutes or so, a step that serves to further intensify the flavor. This reduced juice is then reintroduced into the banana pulp and pulverized together with the help of a potato masher until it’s relatively smooth and paste-like. 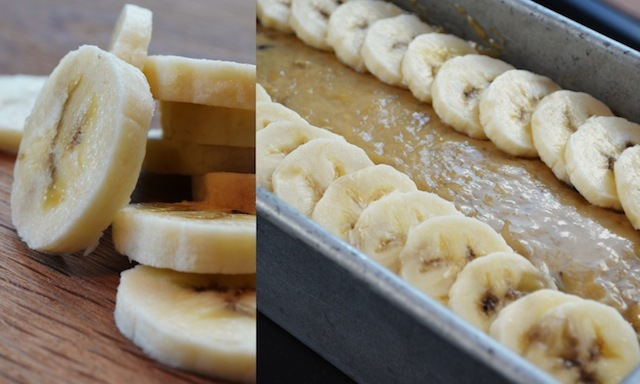 Finally, your bananas are ready for baking. I say “finally” but the truth is that all of these steps are both fast and simple, and the payoff—intense banana flavor held within a cake that is moist but never soggy—is well worth it. What’s more, all that remains after these preparatory steps is to whisk the fruit with the butter (one stick, melted and cooled slightly), the eggs, the light brown sugar, and the vanilla, and then to introduce this mixture into the dry ingredients (the flour, the baking soda, and the salt), stirring until just combined, but with some streaks of flour still remaining in the mixture. At this point you can fold in the ½ cup of toasted and chopped walnuts if you’re using them, or you can do as I did (no big surprise here) and replace them with a ½ cup of bittersweet chocolate morsels. Pour the batter into a loaf pan that’s been coated with nonstick cooking spray, place overlapping banana slices along either side of the loaf’s surface, sprinkle with granulated sugar, and bake in a 350˚ oven until a toothpick inserted in the bread’s center comes out clean (start checking at 55 minutes but it may take up to 20 minutes more—mine did). Once it’s done, the bread should be given 15 minutes or so to cool before being removed from its pan. Undoubtedly, the addition of those chocolate morsels ratchets up the sweetness quotient here, something that may not be to everyone’s liking. For me, though, it proved the perfect counterpoint to the warm flavor of the banana, while also introducing a pleasing textural component into the finished product (seriously, is there anything better than biting through the wonderful density produced by baked flour, sugar, and eggs only to meet a pocket of soft chocolate?). 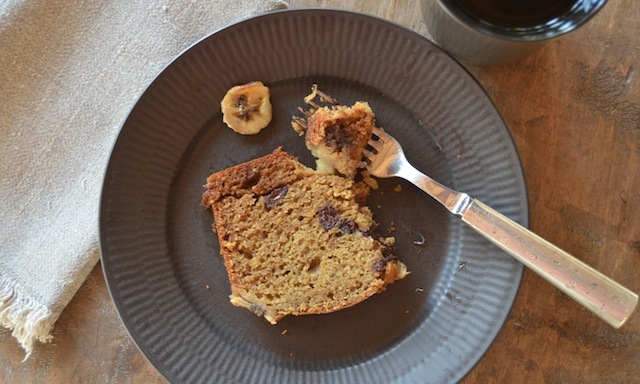 But even without the chocolate addition this banana bread is the sort of thing you can’t stay away from—something I discovered the first time I sampled it and kept returning for another slice, and then another. If you have a weakness for banana bread of any kind this is the last recipe for it that you’ll ever want. 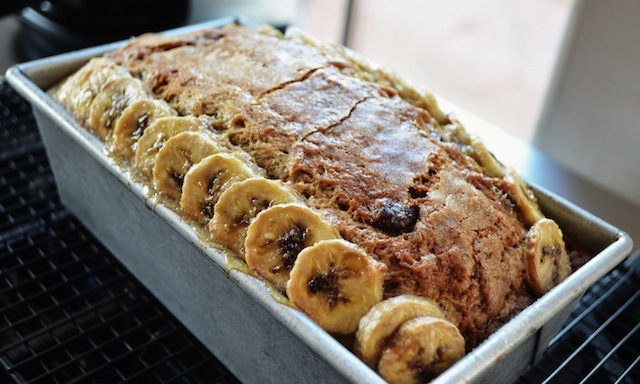 Note #1: Be sure to use very ripe bananas or the loaf will be bland. Note #2: This recipe can be made with thawed frozen bananas; since they release a lot of liquid naturally, bypass the microwaving in step 2 and go directly into the fine-mesh strainer. Do not use a frozen banana for the topping in step 4, however, as it will be too soft to slice. Note #3: If using a slightly larger pan than the one called for in the recipe (like a 9- by 5-inch variety) start checking for doneness five minutes earlier. Note #4: The loaf can be stored (cool completely first), covered tightly with plastic warp. 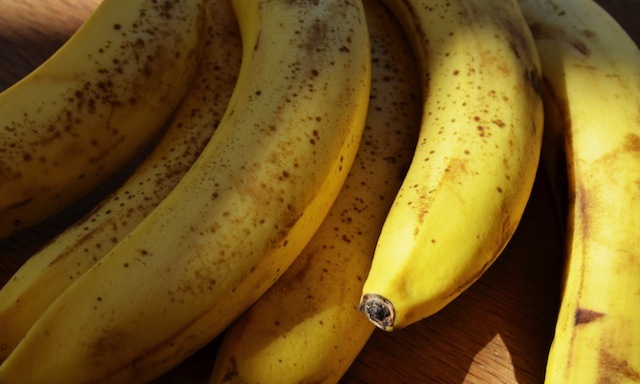 TRG note: If you don’t have any ripe bananas on hand try placing the unpeeled bananas on a cookie sheet and place in a 300˚ oven for one hour. Do this only for the bananas being used in the batter, and not the one for the topping. —Adjust oven rack to middle position and heat oven to 350˚. Spray 8½ by 4½-inch loaf pan with nonstick cooking spray. 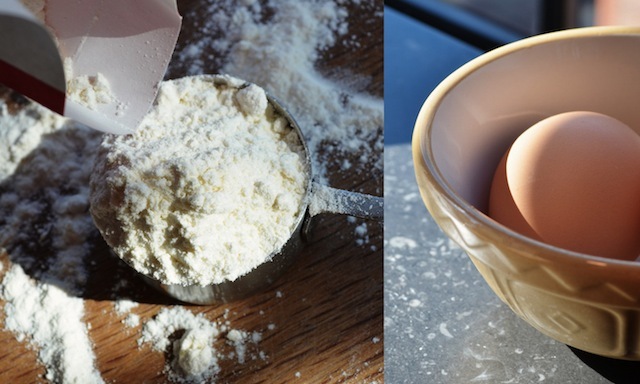 Whisk flour, baking soda, and salt together in large bowl. Set aside. —Place 5 bananas in microwave-safe bowl; cover with plastic wrap and cut several steam vents in plastic with paring knife. Microwave on high power until bananas are soft and have released liquid, about 5 minutes. Transfer bananas to a fine-mesh strainer placed over medium bowl and allow to drain for 15 minutes, stirring occasionally (you should have ½ to ¾ cup liquid). —Transfer liquid to medium saucepan and cook over medium-high heat until reduced to ¼ cup, about 5 minutes. Remove pan from heat, stir reduced liquid into bananas, and mash with potato masher until fairly smooth. 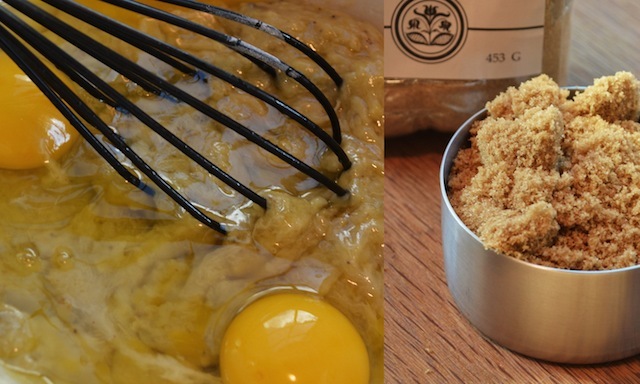 Whisk in butter, eggs, brown sugar, and vanilla. 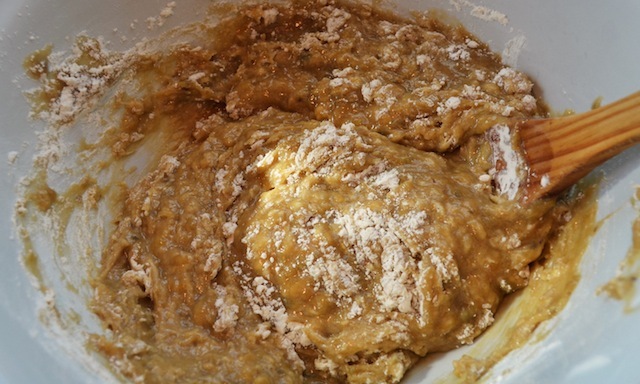 —Pour banana mixture into flour mixture and stir until just combined with some streaks of flour remaining. Gently fold in walnuts and/or chocolate chips, if using. Scrape batter into prepared pan. —Slice remaining banana diagonally into ¼-inch-thick slices. Shingle banana slices on top of either side of loaf, leaving 1½-inch-wide space down center to ensure even rise. Sprinkle granulated sugar evenly over loaf. —Bake until toothpick inserted in center of loaf comes out clean, 55 to 75 minutes. Cool bread in pan on wire rack 15 minutes, then remove loaf from pan and continue to cool on wire rack. —Serve warm or at room temperature.